PTU Sponsored Seminar on the theme of ‘Foreign Languages & Placement: A Vital Connection’ was organized at GGS-Sachdeva Group of Institutes, Kharar recently. Dr.S K Mahala, Vice –Principal, GGS College of Modern Technology & organizer of the seminar welcomed the guests. GGS-Sachdeva Group, Chairperson, S. Surinder pal Singh Sachdeva & Gurmeet Singh Sachdeva inaugurated the seminar with lamp lighting ceremony. 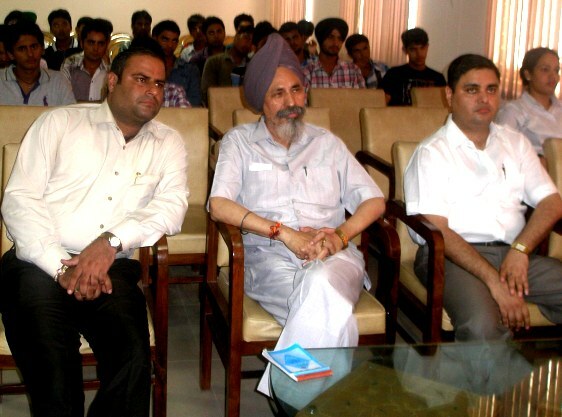 While giving his inaugural address, Chairperson, GGS-Sachdeva Group, S .Surinder pal Singh Sachdeva motivates the students regarding learning of foreign languages .He further added that learning any foreign language will provide an excellent opportunity for better placement both in India & abroad.Dr.Prabjot Kaur, Incharge, Punjab Technical University (PTU), gave information regarding the PTU foreign languages Programmes for students to help them compete internationally .Ms. Navneet kaur, Faculty, French & S. Navkiran Singh, Faculty, German, PTU spoke on the importance of French & German language.Dr.G S Virdi, Director, GGS-Sachdeva Group gave a vote of thanks to all the delegates and participants. Dr.Virdi further added that learning foreign language will help in bridging gap between job providers & job seekers also.